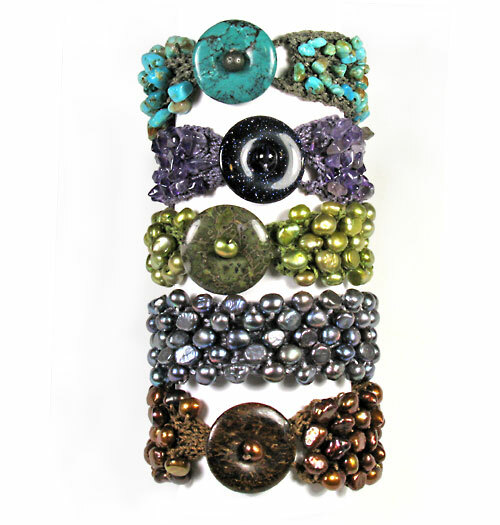 The Knitted Bracelet kit are ready made packages with beads and C-Lon Bead Cord and all the materials needed for the project. A printed pattern is added at no extra charge for your convenience. Personal Note - I made my first knitted bracelet as a sample for Stitches West to show what could be done when knitting with the C-Lon Bead Cord. I got lots of request for the pattern. Since then I made a second one while in vacation in Mexico for my mother's birthday, then my aunt saw it and she wanted one... I have made many since then, all with fresh water pearls, natural or dyed, and gemstone chips. This pattern can be adapted to other types of beads. For this project you will need basic knitting & crochet skills such as casting on, the knit & purl stitch and decreasing. For the crochet part, all you need is single chain stitch. The cultured freshwater pearls that come in the kits are bleached, dyed or bleached & dyed. They come pre-strung on an elastic cord and must be strung onto the C-Lon Bead Cord for this project using beeswax to make a self needle. 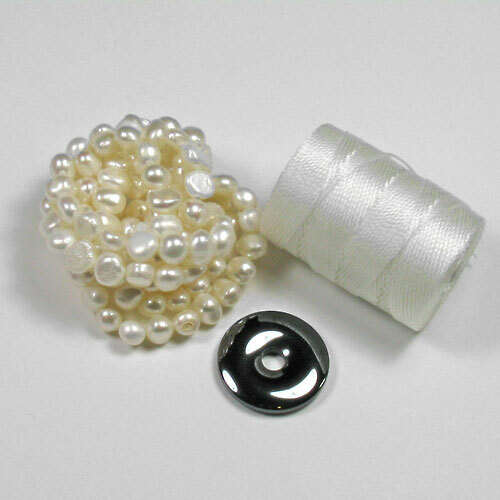 Read blog on best way to load beads onto cord. Personal Note - While knitting some samples with C-Lon Bead Cord and C-Lon Tex 400 Cord with regular knitting needles, I found myself holding the needles tighter and tighter, leading to cramping of my hands. I discovered the Kollage's Square Needles at Stitches West. Now I am hooked, they are so easy on the hands and I would not consider knitting again with regular needles especially with bonded nylon cord. Try them out! These needles are recommended particularly for anyone with arthritis, carpal tunnel syndrome and stiffness in hands and fingers. In addition some knitters have found that their stitches are more consistent. As with all knitting projects, checking gauge is recommended. The Kollage Square DPN are available 7 inches (17.78 cm) lengths. 5 needles per pack. Made out of high grade anodized aluminum. All the needles in stock are made in the USA and anodized in a silver tone. Designed for working with wax models. 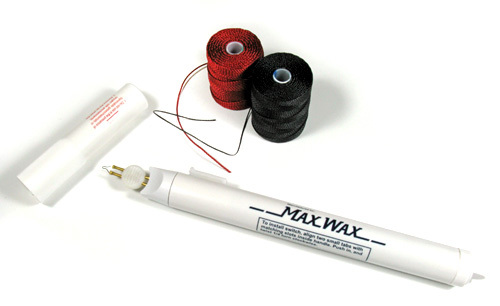 For burning the ends of thread it works just like the standard thread burner, with the addition of an extra battery. It burns hotter and gets to a higher temperature faster, so it is recommended for C-Lon Bead Cord and Chinese Knotting Cord. 9" (22.5 cm) long. Some people recommend going up a needle size to gain proper gauge, but when testing we did not not observe this.